It takes a particular type of geek to combine technical pastry with classic science fiction. But with the culinary gods as my witness, I am that geek. At long last, here it is - the Star Wars inspired Buche de Noel (Yule Log), or as I've been calling it, a Buche de Endor. 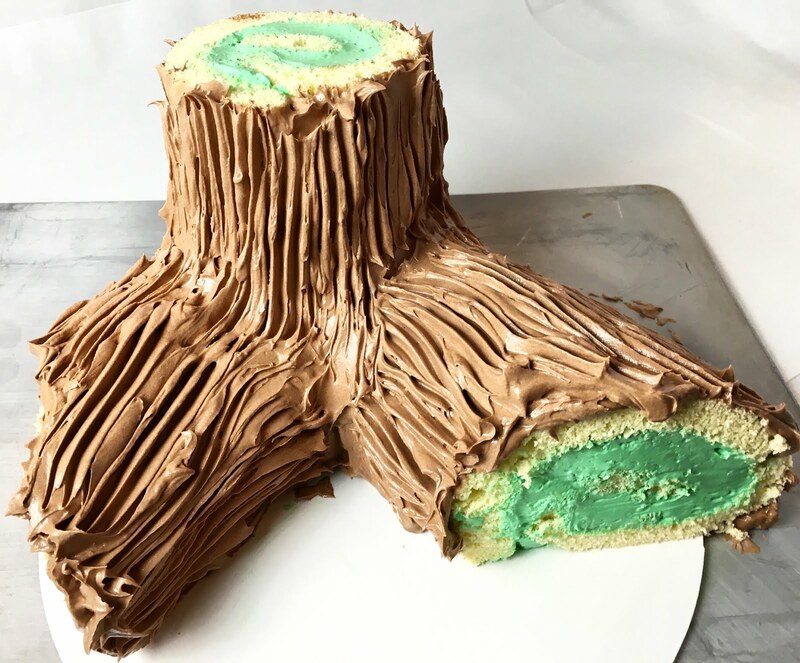 Pulling together several recipes on the Blog from earlier this week, including Sponge Cake and Italian Buttercream Frosting, this Cake clearly highlights how, when it comes to a Buche de Noel, there really are no rules. 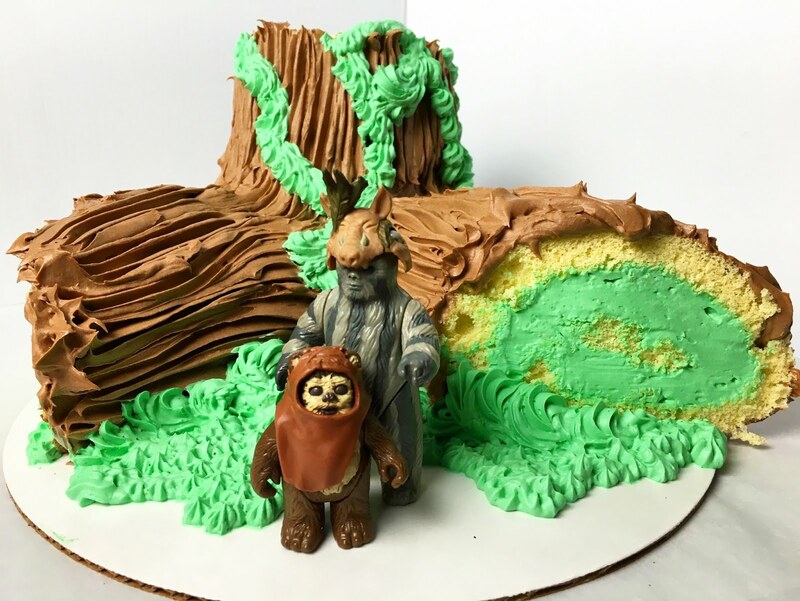 While Frosting flavors and decorations are up to you, my Star Wars inspired Buche de Noel features Mint and Chocolate Buttercream - a classic flavor combination. Any Buche de Noel, classic or crazy, begins with a good Sponge Cake. As with any Cake, taste should be the primary consideration. But this particular Sponge Cake also needs to be moist and flexible so that it can be rolled without tearing or cracking. To avoid tears and cracks, do not over-bake the Sponge Cake. A sheet of Sponge Cake takes less (usually much less) than 15 minutes to bake. It should just begin to brown and spring back to touch. And to prevent carry-over cooking, transfer the baked Sponge Cake to a cool sheet tray or wire cooling rack as soon as it is removed from the oven. For best results, it is also recommended that you assemble the Buche de Noel not long after the Sponge Cake has cooled. The longer the Sponge Cake is left open to the air, the drier and more crumbly it will become. Wrapping the Sponge Cake in plastic wrap will help to keep it moist, but it is not a perfect solution. The Sponge Cake can be made in advance and stored in the refrigerator or freezer, wrapped in plastic. Before the Sponge Cake is used for a Buche de Noel, it should be allowed to temper to room temperature while still wrapped in plastic. A Sponge Cake that has been refrigerated or frozen is more likely to crack or tear when rolled, but if time is an issue, this can be a helpful solution. The other main ingredient for a good Buche de Noel is Italian Buttercream Frosting. Buttercream Frosting works well both as a filling and for decorative work, so it is perfect for a Buche de Noel That said, there's no reason why you couldn't roll the Sponge Cake with Raspberry Bakers' Jam, like a Swiss Roll, or coat it with a Cream Cheese Frosting. One full recipe of Italian Buttercream Frosting is enough to fill, coat and decorate one Buche de Noel made from a half sheet tray (18"x13") of Sponge Cake. Set aside 2/3 (approximately 600g) for the Mint Buttercream, which is used to make the filling and for some decorations. To flavor and color the Mint Buttercream, simply beat in Mint Extract and Green Food Gel until it is well incorporated. Add the Mint Extract to personal taste (one Tablespoon will make for a very minty flavor). As for the coloring, do not attempt to use cheap, water-based food coloring. In the dense, fatty foam of a Buttercream Frosting, these colors will disappear. Food Gel is a must to achieve a deep color. Chocolate Buttercream is slightly more technical, but it is delicious and worth a little effort. Begin by heating Semisweet Chocolate over a double boiler until it is just melted. You do not want the Chocolate to be hot as it will melt the Buttercream Frosting when the ingredients are combined. Have the remaining Buttercream Frosting you previously set aside (approximately 300g) ready in the bowl of an electric mixer fitted with a paddle attachment. 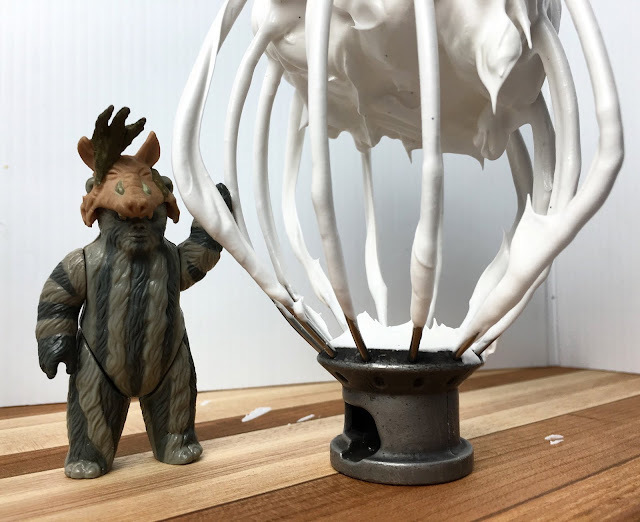 With the mixer on medium speed, quickly pour all of the melted Chocolate into the bowl of Buttercream Frosting. 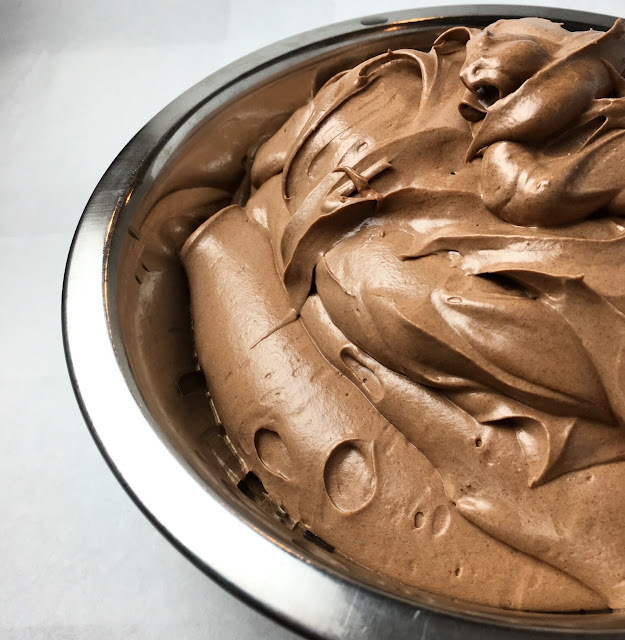 When the Chocolate is mostly incorporated, increase the mixer speed to high and beat the Chocolate Buttercream until it is smooth and homogeneous. It is best to assemble the Buche de Noel as soon as the Sponge Cake has cooled to room temperature. Begin by evenly spreading a thin layer of the Mint Buttercream Frosting over the entire surface of the Sponge Cake using a large offset spatula. The filling should be no thicker than 1/4" or else it will be overwhelming. 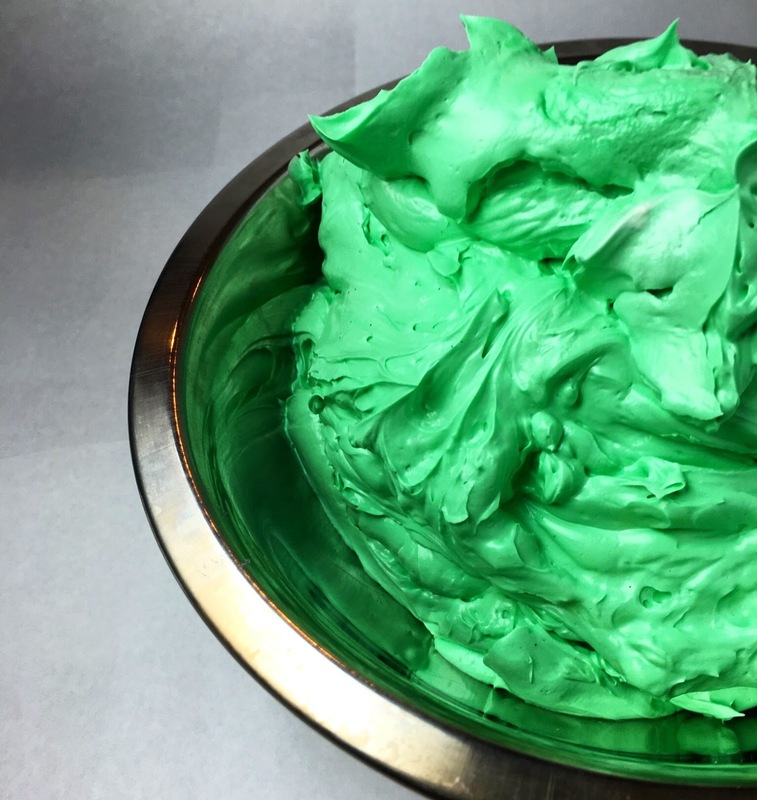 You should have ample Mint Buttercream Frosting remaining for decorations. Set it aside in a cool place or in the refrigerator. Now it's time to roll the Sponge Cake. Be patient... roll slowly... work carefully. Even before you begin, if the Buttercream Frosting seems too soft, put the entire frosted Sponge Cake in the refrigerator for a couple of minutes before proceeding. In fact, if the Buttercream Frosting ever seems too soft, place everything in the refrigerator to set before you have a true mess on your hands. When you are ready to proceed, tightly roll the Sponge Cake into a spiral, starting with the long edge of the Sponge Cake facing you (so the rolled Sponge Cake will be a long, 18" cake). 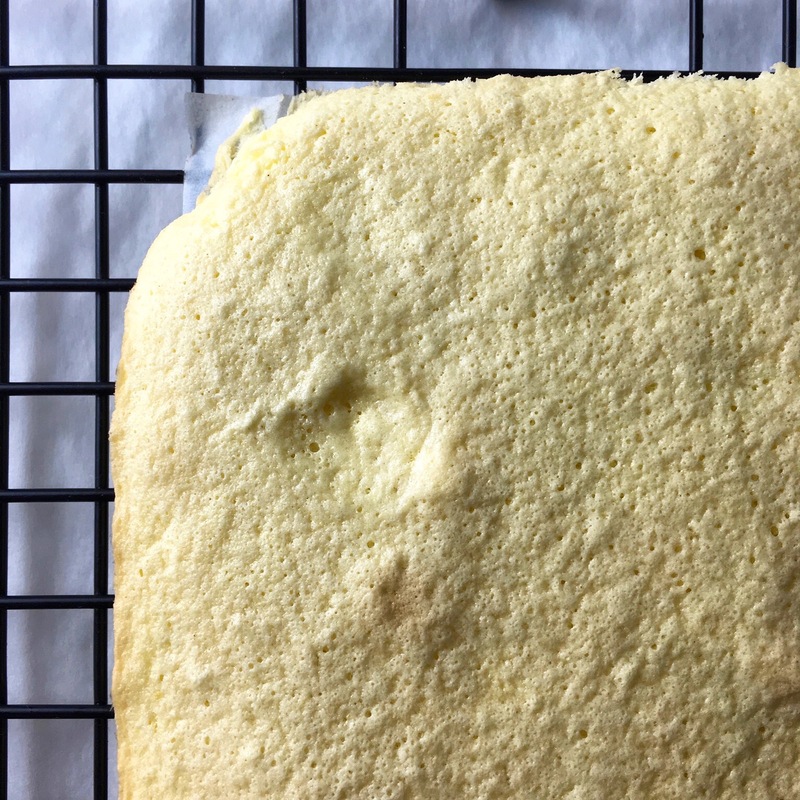 Stop rolling when you reach the end of the Sponge Cake and arrange the ending seam so that it is on the bottom. At this point, loosely cover the rolled Sponge Cake in plastic wrap and put it in the refrigerator to set for approximately 15 minutes. 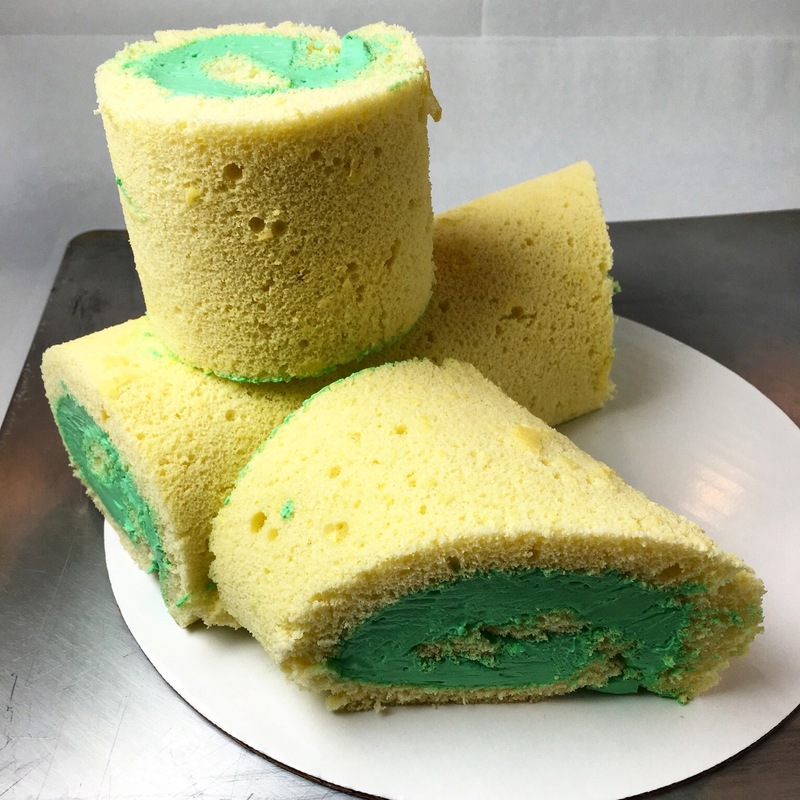 After at least 15 minutes in the refrigerator (the Mint Buttercream Filling should be firm), carefully trim off the ends of the rolled Sponge Cake with a sharp bread knife to reveal a clean spiral. At the point, you can cut and form the final Buche de Noel however you wish. As in the above photo, for a dynamic looking Yule Log, cutting the rolled Sponge Cake into three pieces works nicely. One longer piece serves as the base. A second, shorter piece is cut from one end at a 45 degree angle and placed up against the longer base. A third, and even shorter piece, is cut straight and placed vertically as if it were growing out of the base. The Buche de Noel is covered in the Chocolate Buttercream with an offset spatula. The frosting process begins with the two bottom base pieces. 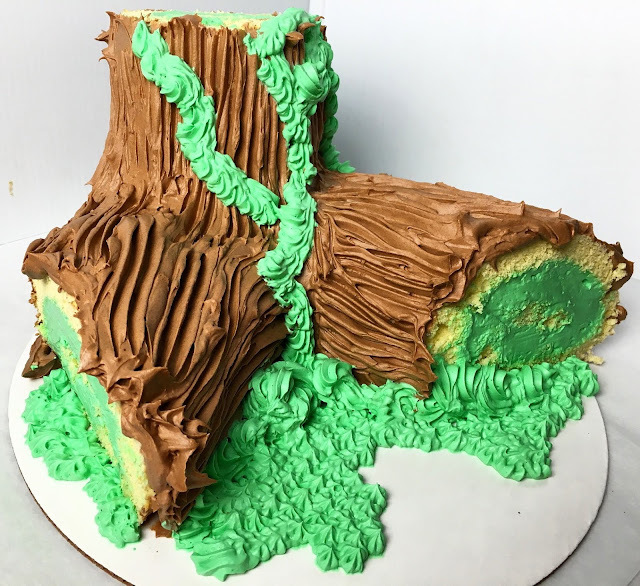 Since the Chocolate Buttercream Frosting is intended to look like the bark of a tree, you do not need to worry about applying it smoothly. However, it should still be of relatively consistent thickness and no more than 1/4" thick at any spot. While it is a matter of personal preference, I recommend keeping the ends of the Buche de Noel unfrosted so that the spiral is clearly visible. With the base pieces of the Buche de Noel fully coated, the top piece can be placed on top and also frosted with the Chocolate Buttercream. With the entire Buche de Noel covered in the Chocolate Buttercream Frosting, bark-like texture can be added by gently raking a fork over the surface. Be careful to use a light hand or you may cut into the Cake itself. 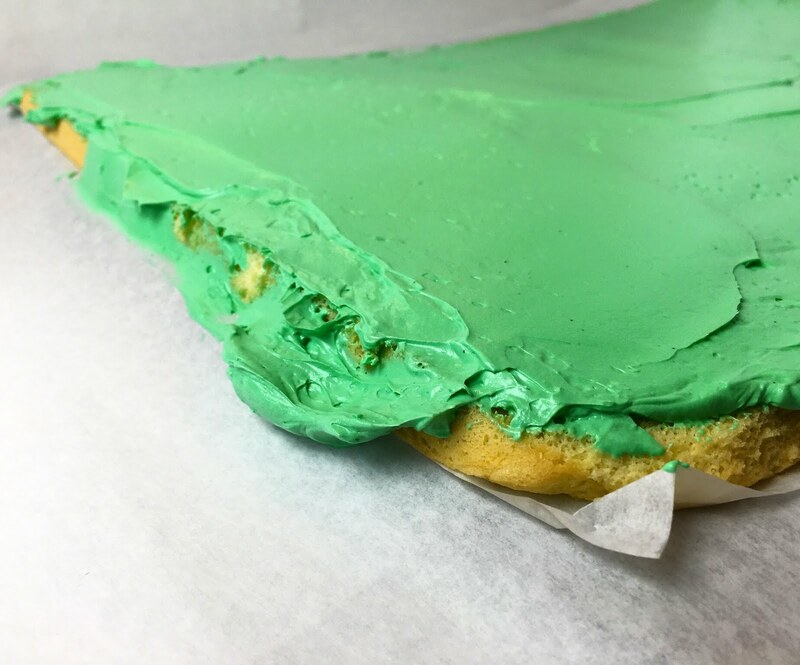 The remaining Mint Buttercream Frosting can be put in a pastry bag fitted with a small star tip (#2) to apply decorations such as grass and vines. The assembled Buche de Noel can be refrigerated for a week or frozen for up to a month when wrapped well in plastic wrap. Before wrapping the Buche de Noel, place it in the refrigerator until the Buttercream Frosting hardens. This way, the Buttercream Frosting will not stick to the plastic wrap. When the Buttercream Frosting is hard, wrap the Buche de Noel in at least two layers of plastic wrap. A refrigerated or frozen Buche de Noel should be tempered to room temperature before serving. Allow the Buche de Noel to partially temper while still wrapped in plastic wrap. Once the Buttercream Frosting begins to soften, remove the plastic wrap and allow the Buche de Noel to continue to temper. 1. Prepare the Sponge Cake and immediately transfer it to a cool sheet tray or wire cooling rack. Chef's Note: A freshly baked Sponge Cake is best, but the Sponge Cake can be prepared in advance and then refrigerated or frozen. A refrigerated or frozen Sponge Cake should be allowed to temper to room temperature while still wrapped in plastic wrap to retain moisture. Sponge Cake that has been refrigerated or frozen is more likely to crack or tear when rolled. 2. Prepare the Buttercream Frosting, beating it until it is smooth and shiny. 3. Remove 1/3 (300g) of the Buttercream Frosting and set it aside. Add the Mint Extract and Green Food Gel to the remaining Buttercream Frosting (600g) and beat it smooth. 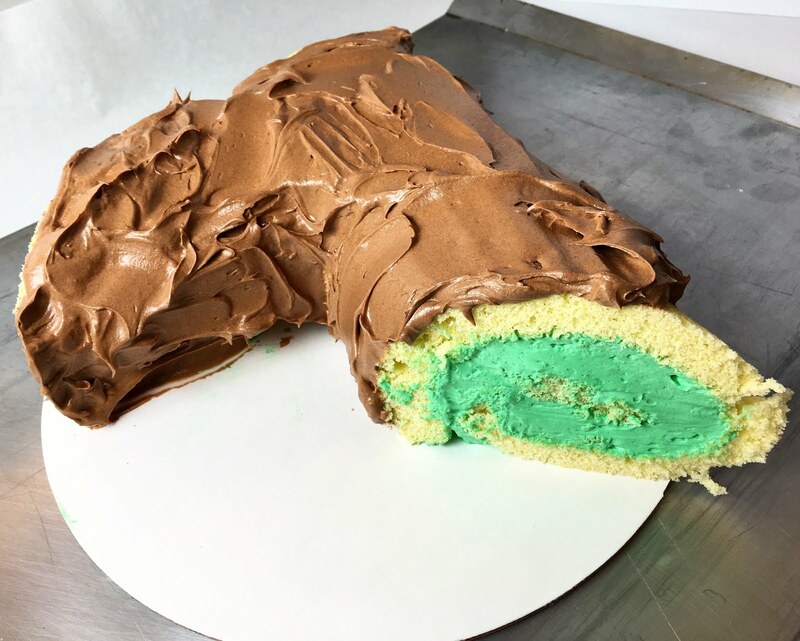 Remove the Mint Buttercream Frosting from the mixer bowl and set it aside in a cool place. 4. Gently heat the Semisweet Chocolate over a double boiler until it is just melted. As the Semisweet Chocolate melts, place the reserved Buttercream Frosting (300g) in a clean mixer bowl. While beating on medium speed, pour all of the melted Semisweet Chocolate into the bowl. When the Semisweet Chocolate is mostly incorporated, increase the mixer speed to high and continue beating until the Chocolate Buttercream Frosting is smooth and homogeneous. Chef's Note: While preparing and working with Buttercream Frosting, if at any time it becomes too soft or runny, place it in the refrigerator for several minutes. 5. Once the Sponge Cake has cooled to room temperature, evenly spread a thin layer (no more than 1/4" thick) of Mint Buttercream Frosting over the surface with an offset spatula. You will have some Mint Buttercream Frosting remaining for decorations. Set it aside in a cool place or in the refrigerator. 6. Beginning with the long edge (18") of the frosted Sponge Cake facing you, carefully roll the Sponge Cake into a tight spiral. When you reach the end, arrange the Sponge Cake so that the edge seam is on the bottom. 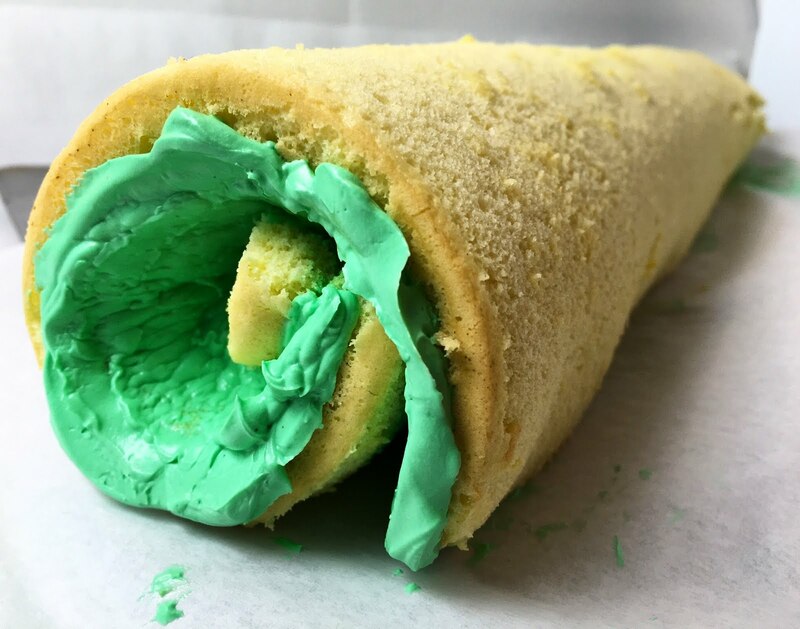 Loosely cover the rolled Sponge Cake with plastic wrap and place it in the refrigerator until the Buttercream Frosting hardens - approximately 15 minutes. 7. 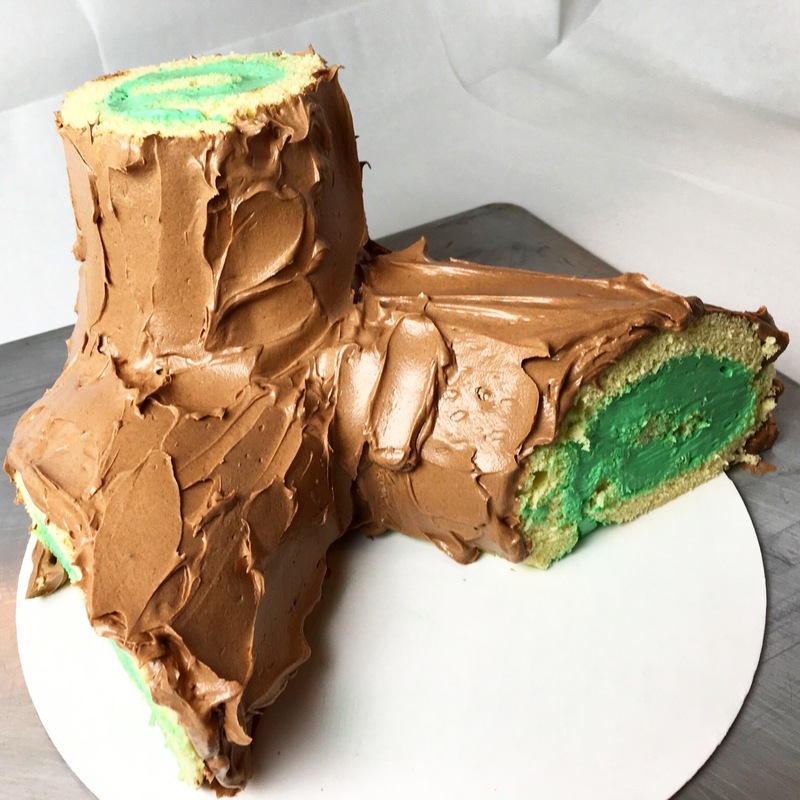 When the Buttercream Frosting has hardened, remove the rolled Sponge Cake from the refrigerator and trim off the ends with a sharp bread knife to reveal a clean spiral. Chef's Note: At this point the rolled Sponge Cake can be cut and assembled in many ways to look like a log or branch. Read the full Blog post for suggestions. 8. 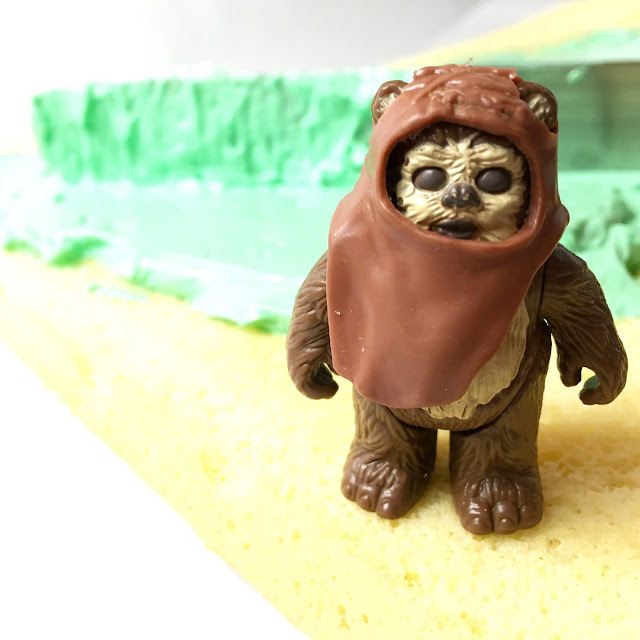 Cover the rolled Sponge Cake with an even layer of Chocolate Buttercream Frosting. 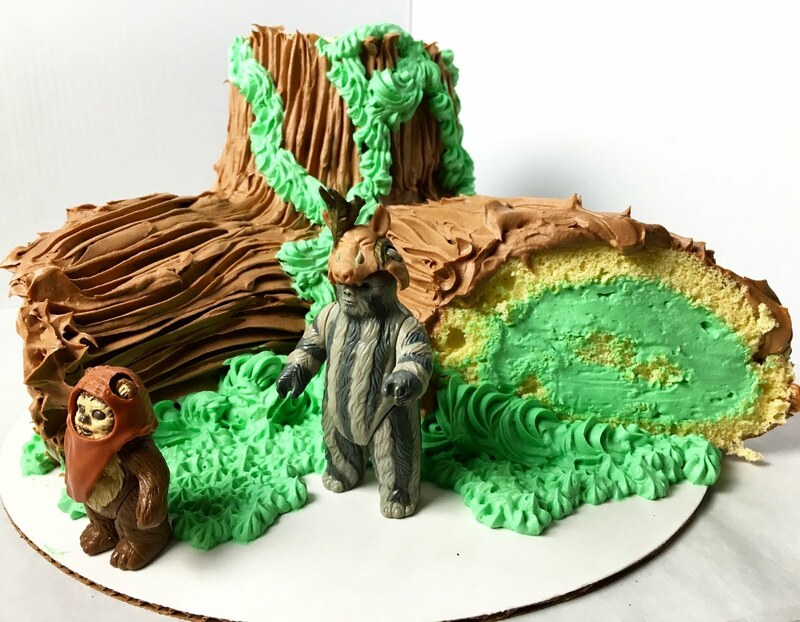 The Chocolate Buttercream Frosting is intended to look like bark on a tree, so it does not need to be perfectly smooth. However, it should be of relatively consistent thickness and no more than 1/4" thick in any spot. 9. To create a bark-like appearance, gently rake a fork over the surface of the Chocolate Buttercream Frosting, being careful not to cut too deep into the underlying Sponge Cake. 10. If desired, use the remaining Mint Buttercream Frosting to pipe decorations such as leaves or vines on the Buche de Noel. - The assembled Buche de Noel can be refrigerated for a week or frozen for up to a month wrapped well in plastic wrap. Before wrapping the Buche de Noel, place it in the refrigerator until the Buttercream Frosting hardens. This way, the Buttercream Frosting will not stick to the plastic wrap. When the Buttercream Frosting is hard, wrap the Buche de Noel in at least two layers of plastic wrap. - A refrigerated or frozen Buche de Noel should be tempered to room temperature before serving. Allow the Buche de Noel to partially temper while still wrapped in plastic wrap. Once the Buttercream Frosting begins to soften, remove the plastic wrap and allow the Buche de Noel to continue to temper. Loved your star wars motiff-! Mother made 2 logs, one with alcohol, one not. But the chocolate grand Marnier center was divine. Grand Marnier is a personal favorite! I absolutely love anything chocolate and orange.